1987 - the year of Bond! a-ha are amongst artists such as Queen and Paul McCartney who are asked if they would like to perform the new James Bond song. Pål and Magne have already written the basis of a song which they feel would be suitable and send it in. This song is chosen to be used for the next James Bond film "The Living Daylights". During the recording process of the song, it becomes apparent that John Barry has a problem with not being one of the song writers and therefore replaces Magne's name in the credits for his. a-ha attend the BPI-awards at the Royal Albert Hall in London. An interview Morten and Magne in Munich (15.11.1986) is broadcast on the German TV show "PIT". 3	In the morning Morten appears on an outside broadcast of "Saturday Superstore" in Harrogate to pick the winner of the a-ha competition. 5	Empire Theatre, Liverpool, England. 6	Apollo Theatre, Manchester, England. 6? At the Australian "Videoawards", a-ha get an award for their "Hunting High And Low" video and send a thank you greeting via satellite from Manchester. In the UK, a-ha receive another award for their video for "Hunting High And	Low". 11	St David's Hall, Cardiff, Wales. 12	Newport Centre, Newport, Wales. 13	Colston Hall, Bristol, England. 14	Colston Hall, Bristol, England. 19	Fairfield Hall, Croydon, England; at this show, the song "We're Looking For The Whales" is recorded for the B-side of a future single "Manhattan Skyline". Also at this show, John Barry, with whom a-ha are going to record the next James Bond theme, "The Living Daylights", attends and meets a-ha for the first time. 21	Kings Hall, Belfast, Ireland. 22	a-ha are on the TV show "Good Evening Ulster" from Kings Hall, Belfast, Ireland. 24	The Spellemannspris-show takes place at the Oslo konserthus. a-ha are nominated for two prizes: The album "Scoundrel Days" is nominated in the category "Best Pop album" (together with "Here we go again" by Egil Eldøen and "Dansere i natten" by Bjørn Eidsvåg) and "Hunting High And Low" is nominated in the category "Best video". a-ha's manager, Terry Slater, collects the first award on behalf of the band and tries to speak Norwegian. For the second award, they show a recorded thank you from a-ha, filmed at an airport. a-ha also receive a special honour prize which they collect in person from the Norwegian foreign minister Knut Frydenlund. They also perform "Manhattan Skyline" at the end of the show. Morten attends the exclusive party at the Sjølystsenter afterwards, but asks not to be photographed by the press. 25	International Centre, Bournemouth, England. "Cry Wolf" spends its last week in the UK Top 75; a total of 9 weeks. "Cry Wolf" is released in Japan. 28-29	a-ha are in the studio to film the video for "Manhattan Skyline" which is directed by Steve Barron. 30	a-ha return to Norway to do their first live performance since they left in 1983. In Kristiansand, the band are interviewed and (only) Morten is given a Norwegian "Setesdal" sweater, which Magne and Pål make fun of during the interview. Also "Levis" in Norway takes the opportunity to give a-ha some denim jackets with the "a-ha" logo on it. These jackets sell out immediately after a-ha are seen wearing them on TV shows. The Norwegian newspaper "Aftenposten" claims that a-ha pay for rooms in every hotel and guest house in Kristiansand to fool the fans and press who are trying to find out where they are staying. The concert takes place at Gimlehallen, Kristiansand, Norway and 4,400 people attend. There are big problems with the concert as the tecnical equipment arrives late, two hours before the soundcheck is due to begin. In addition to that, a power failure in the district of the concert hall creates more problems. a-ha again ask the press to sign a photo contract which most of the press boycott, except "Stavanger Aftenblad", "Se & Hør", "Søndag Søndag" and "VG". As a result, only very few journalists get interviews and all press conferences during the Norwegian tour are cancelled. The support band are Norwegian "Avenue Talk" from Bergen and the Norwegian leg of the tour is sponsored by "Agree" shampoo. 31	The Norwegian TV show "Frokost-TV" shows a report on how Morten got a traditional Norwegian sweater which was made especially for him by Setesdal Husflidssentral in Valle. Idrettshallen, Stavanger, Norway. This hall houses 7,000 people. 150 security guards are hired especially for the evening, along with two additional fences to keep the audience back from the stage. "Avenue Talk" are again the support band. 1	Bergenshallen, Bergen, Norway. The venue is changed for this show (originally it was going to be the Tennis Paradis) which holds 7,500 people. 200 security guards are hired and "Avenue Talk" support the show. 3	a-ha are filmed at Tromsø airport and Magne is joking around with snowballs. This is shown on Norwegian news. Skarphallen, Tromsø, Norway. Support act are "Bad Boys", consisting of Steinar Albrigtsen, Tom Steinberg and Per Furøy. 4	Leangen Ishall, Trondheim, Norway. 6	a-ha do 4 shows instead of the scheduled 2, at Drammenshallen, Drammen, Norway, starting tonight. 50 girls from Japan have flown over to Norway just to see one of the four a-ha concerts at Drammenshallen. Some of them won a pop magazine competitions, others travelled at their own cost. In Drammen, Magne and Pål are given Norwegian "Setesdal" sweaters. The Norwegian TV programme "Blikkbåx" sends some kids to the Drammenshallen to interview a-ha. 7	Drammenshallen, Drammen, Norway;. The Norwegian TV show "Blikkbåx" is broadcast. Two fans introduce a-ha who sing "Manhattan Skyline" on the UK TV show "Jim'll Fix It" (filmed earlier in the year). 8-15	The Norwegian Bible Organisation "Norske Bibelselskap" organises a week for the bible, "Bibelen Åpen for Alle" and hand out a magazine called "Godt Nytt" in which Morten is interviewed about the bible. 10	a-ha have a meeting with King Olaf of Norway. Afterwards, they are invited for tea and cakes with the head of parliament, Jo Benkow. Morten and Pål wear their Norwegian "Setesdal" sweaters, causing large increases in the sales of these sweaters at Valle Husflidsentral. Drammenshallen, Drammen, Norway (extra show). All profits from this show go to various charities such as Cancer Aid, Amnesty International and an organisation helping to reclaim the desert. Ticket prices are raised to 175 NOK and a-ha perform for free. Aftenposten and employer Gunnar Eide agree to sponsor the show. The audience are asked to wear only red, white or blue to the show and the concert is filmed by NRK. Some of the songs (IBLY CW MS SD) are dubbed and broadcast as part of an NRK Special, together with interviews with the band members plus Norwegian politicians, cultural and religious representatives who attend the concert (broadcast on 14.02.1987). 13	"Manhattan Skyline" is released in Germany. 14	NRK broadcast an "a-ha-special", featuring four songs (IBLY CW MS SD) from the concert in Drammen on 10 February plus interviews with the band members. 14? Morten and his family go on a ski holiday to Blefjell in Bolkesjø. He allows VG to get an exclusive photo report of him in the snow. 16	Back in the UK, "Manhattan Skyline" is released; Mags and Pål worked with Gerry W.W.Kitchingham on the remix of this song. 22	"Manhattan Skyline" enters the UK charts at No.17. "Manhattan Skyline" is released in Norway; it gets to No.4 in the charts and stays in the Top 100 for 4 weeks. a-ha finally have time for holiday. 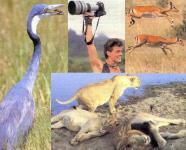 Morten goes to Africa and goes on a Safari to Tansania, where he takes photos of the animals to be published in a photo book due for release in Japan. He also goes to Sri Lanka where he meets up with Mags for a "Worldview" conference. 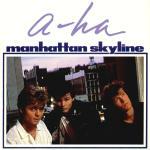 1	"Manhattan Skyline" reaches its highest position of No.13 in the UK charts. 3	a-ha perform "Manhattan Skyline" on "Top Of The Pops"; (broadcast 5 March 1987). 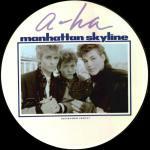 5	"Top Of The Pops" broadcast a-ha's performance of "Manhattan Skyline". 29	"Manhattan Skyline" spends its last week in the UK Top 75; a total of 6 weeks. 19	The album "Hunting High And Low" spends its last week in the UK Top 75; a total of 77 weeks. 24	a-ha are interviewed on Italian Radio "Rai Stereo 2". 26	On the Italian TV programme "Domenica In" there is an interview between a-ha and Raffaella Carrà. a-ha perform "Cry Wolf" and "Manhattan Skyline". In Bari, the festival "Azzurro 87" is taking place. On the first evening a-ha perform "Cry Wolf" and "Manhattan Skyline" and receive an award. The album "Scoundrel Days" spends its last week in the UK Top 75; a total of 29 weeks. 27	Still in Bari, the second evening of the "Azzurro 87" festival takes place. a-ha again perform "Cry Wolf" and "Manhattan Skyline" and they also play "I've Been Losing You". On the Italian TV show "Ciak", a-ha perform "The Living Daylights" and on "Sandra E Raimondo Show" they perform "Cry Wolf". In Italy, a-ha are also interviewed for the TV-show "Be Bop A Lula" and they talk about their holidays. 12	On the French TV show "C'est Encore Mieux La Midi" (Antenne 2), they show a-ha performing "Cry Wolf" outside on a terrace (twice). During the performance, Morten gives autographs. 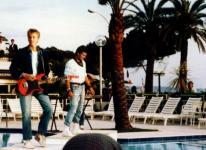 For the French TV show "Avis de recherche", a-ha perform "Cry Wolf" outside, next to the swimming pool Palm Beach. a-ha also perform "Cry Wolk" for a French TV show at a smaller swimming pool; Pål and Morten stand on stepping stones in the swimming pool during the performance. 13	a-ha are at the "Goldene Rose Festival" in Montreux, Switzerland where they perform "Cry Wolf", "Manhattan Skyline", "The Living Daylights" and "I've Been Losing You"; some of these tracks along with a short interview with Mike Smith is shown on UK TV on 22nd and 29th May 1987. 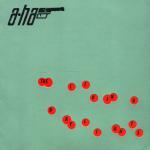 All the 38 artists (including a-ha) mime to their songs. 14	At the film festival in Cannes, the new James Bond film "The living daylights" is previewed. a-ha are not present. 14? a-ha are interviewed at the castle Château Chiande in Montreux for MTV US. a-ha are also interviewed (by Mike Smith) for UK "Radio 1"; for the Italian "videomusic interview special" and for the Italian show "Be Bop A Lula". 15	In Montreux, the "IM&MC Gala" (part of the Goldene Rose Festiva) takes place (and is broadcast live on Swiss TV): a-ha get the "best group video award" (British Industry Award) for "Cry Wolf", Magne gives a speech and they perform "Manhattan Skyline". 22	On UK TV, they show an interview between Mike Smith and a-ha in Montreux plus some of their performance at the festival. Representatives of the Norwegian parliament vote a-ha to be the winner of this year's "Peer Gynt" prize. The prize is always presented during the Peer Gynt Festival in Vinstra and goes to people who have contributed the most to get Norway known abroad. The question is if the group will have time to receive the prize during the first week in August; if not, the prize will go to the missionary Olav Hodne. The band are difficult to reach as they are in a house without a phone in the South of France! 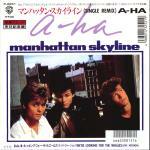 25	"Manhattan Skyline" is released in Japan. 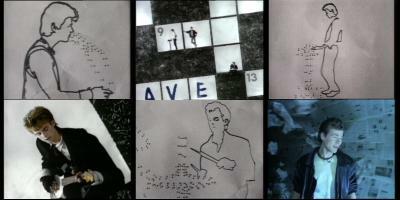 28	a-ha win an award for "Best Video" for "Cry Wolf". In Spain, a-ha perform "Take On Me", "I've Been Losing You" and "Cry Wolf" for "Rock o' Pop" (Derby Festival?). The same day as Rock o' Pop, a-ha are interviewed on Spanish breakfast TV. In Madrid, a-ha are interviewed for "40 principals" and "Radio Espana". Still in Spain, a-ha perform "Take On Me" and "I've Been Losing You" for the TV show "Angel casas". a-ha are interviewed at a Press Conference at the Hyatt Hotel, London and are interviewed on UK "Radio 1". In the summer, some filming for the movie "Kamilla Og Tyven" takes place in the South of Norway near Kristiansand. The film is the debut for the couple Grete Salomonsen Hunnekleiv and Odd Hunnekleiv of Penelope Film A/S and based on the "Kamilla" books by Kari Vinjes. The film is set in the summer of 1913. The main role of the little orphan girl is played by seven-year old Veronica Flåt from Mandal, the male main role of the girl's thief friend is played by Dennis Storhøy. Morten plays the part of the young Kristoffer who lives a modern lifestyle and brings new technology to the village (motorbike, car, plane). The film will also be released in English and dubbed into other languages, so all the scenes are first filmed in Norwegian and then a slightly different and shorter cut of the film is dubbed in English. The film is due to be released at Christmas, but is delayed until 24 March 1988 for the Easter market. 12	Swedish TV have bought the BBC Montreux recording and broadcast part one of the festival in Montreux with a-ha. 19	a-ha start another tour of Japan and France. The set list for this tour has changed a bit from the 1986 tour with the introduction of the songs "Maybe Maybe", "The Swing Of Things", "The Weight Of The Wind", "Touchy! ", "The Living Daylights" and the return of "Manhattan Skyline" in place of "Train Of Thought", "Love Is Reason", "Living A Boy's Adventure Tale", "The Blue Sky" and "Driftwood". 21	Nagoya International Exhibition Hall, Nagoya, Japan. 22	On UK breakfast TV, there is a feature on "The Living Daylights" which includes an interview with a-ha. "The Living Daylights" is released in the UK; this single is produced by Jason Corsaro, Mags, Pål and John Barry. Nippon Budokan, Tokyo, Japan. 23	Nippon Budokan, Tokyo, Japan. 25	Makomanai Indoor Stadium, Sapporo, Japan. 26	"The Living Daylights" is released in Germany. 27	Sendai City Gymnasium, Sendai, Japan. 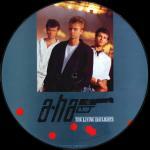 28	"The Living Daylights" enters the UK charts at No.17. 29	Osaka-Jo Hall, Osaka, Japan ; this concert was available on a bootleg LP. The Royal Premiere of the James Bond film "The Living Daylights" is held in London. Charles and Diana from the Royal family attend. a-ha cannot be there as they are on tour in Japan. This does not please the Bond-folk who expected a-ha to cancel their sold-out tour to be at the premiere. John Barry takes this opportunity to speak out to the press about how difficult a-ha are to work with. The decision is made to neglect the song in the States and use another song as the title song for the U.S. version of the movie. 30	The UK TV programme "The Roxy" speaks to Morten on the phone in Japan and shows the video for "The Living Daylights". Kobe World Hall, Kobe, Japan. A music cassette "Vi har en drøm" is released in Norway. All profit from the sale of this cassette is used to help fight against drugs. All of the artists on the album (including a-ha) contribute for free. 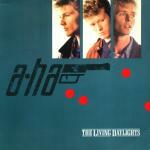 In Italy, a-ha perform "The Living Daylights" on the Italian TV show "Ciak". "The Living Daylights" is released in Norway; it goes to No.1 and stays in the Top 100 for 9 weeks. The German TV show "PIT" broadcasts an interview with a-ha recorded in Montreux. 1	Yokohama Cultural Gymnasium, Yokohama, Japan. 2	Nippon Budokan, Tokyo, Japan. 3	Shizuoka Shimin Bunka Kaikan, Shizuoka, Japan. 5	"The Living Daylights" reaches its highest position of No.5 in the UK charts, it stays there for just one week. 6	Fukuoka Convention Center, Fukuoka, Japan. 7	Matsuyama City Hall, Matsuyama, Japan. 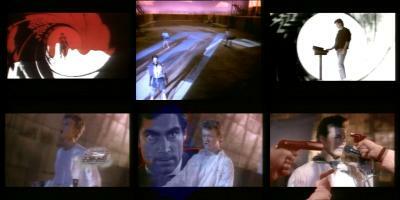 9	"Top Of The Pops" shows the video for "The Living Daylights". Nagano City Culture Hall, Nagano, Japan. 10	Citizen's Culture Hall, Yamanashi, Japan. 11	Niigata Prefectural Civic Center, Niigata, Japan. 12	"The Living Daylights" reaches No.1 in Luxembourg and No.2 in Ireland. Ishikawa Kosei-Nenkin Hall, Ishikawa, Japan. 17	Indoor Arena, Laugardalshöll, Reykjavik, Iceland. 18	Indoor Arena, Laugardalshöll, Reykjavik, Iceland. 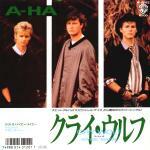 25	a-ha are "Super DJ's" for a Radio station in Japan. 26	In Farsund, Norway, Morten and 12 members of the Harket family sing in a choir. There's a big queue for autographs afterwards. 31	In Kristiansand, the Norwegian premiere of the film "The living daylights" takes place. The mini album "Scoundrel Club" is released in Japan on CD, LP and picture disc. It includes remixes of "Cry Wolf", "Manhattan Skyline", "Hunting High And Low", a dub mix of "I've Been Losing You" and a live version of "We're Looking For The Whales". 2	a-ha receive the Peer-Gynt prize in a ceremony which takes place in the full Vinstrahallen. The Peer-Gynt Festival is part of a week full of traditional music, art exhibitions and celebrations of Norwegian culture (31st July - 9th August) in Vinstra. Only Morten is present at the ceremony (he goes from Oslo to Vinstra just for this event and has to return to Oslo afterwards) and is given the prize by the representative of the parliament, John B. Løken, on behalf of the band. The "Peer-Gynt evening" was moved from 8 August to 2 August due to a-ha's tour of France. Morten also takes part in the dinner at Hågågård where they are served the traditional "Rømmegrøtt". 5	Arenes Théatre, Nimes, France. The James Bond film "The living daylights" is the movie to open the new cinema center in Oslo Colosseum. 6	Les Arènes, Fréjus, France. Part of the soundcheck in Fréjus is filmed and broadcast on French FR3 (TLD). 7	Les Arènes, Fréjus, France. 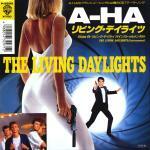 10	"The Living Daylights" is released in Japan. 12	Stade de Prieux, La Baule, France. 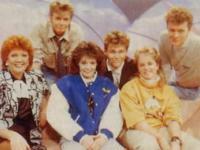 15	The "Seaside Special", where a-ha perform "Cry Wolf" and "The Living Daylights", is broadcast on UK TV. 23	"The Living Daylights" spends its last week in the UK Top 75; a total of 9 weeks. 27	In Berlin, the "Berolina" takes place and a-ha perform "The Living Daylights" and receive the "Berolina" award for best international group. a-ha are at the IFA in Berlin. A special "Warner-Pioneer Not for sale" telephone card was produced in Japan. 13	In St. Paul, Minnesota, USA, the opening of the art exhibition "International Art Show For The End of World Hunger" takes place. It has been arranged against hunger and poverty and will move to Oslo in December where there 20 more Norwegian artists will be added. The Norwegian "Worldview International Foundation" is one of the organisers. As representative for Norway, Morten attends the opening in St. Paul. After Oslo, the exhibition will go on to different countries around the world and end in New York in 1989. 4	The filming for "Kamilla og tyven" finishes. 18	a-ha are amongst the artists to take part in the Norwegian TV-askjonen: during a six hour long TV supporting heart disease ("Hjerte for livet"). a-ha had recorded an interview especially for this occasion at Pål's apartment in London and this is broadcast during the show. They also sing "Cold River". At the Australian "Count Down Awards", a-ha win the award for "Most popular international act" and send video greetings from England. a-ha are recording tracks for their next album in Los Angeles. As with the previous year, Morten is invited to the home of Lars Roar Langslet and they sing Christmas songs around the piano. 26	The Norwegian TV show "LørDan" has "religious customs" as its subject. Morten is invited to discuss religion at the show. Afterwards he sings "Mitt Hjerte Alltid Vanker" and "Her Kommer Julen" with the Norwegian boy's choir Sølvguttene and presents a Gold record to them. 27	a-ha appear on the UK TV programme "Surprise, Surprise", where they surprise two girls and sing one of their forthcoming singles "Touchy! "; this program was recorded before Christmas.